What a wreck....And this picture does not do it justice...really this is just a sampler of my day yesterday. Misc. junk in piles. That is a good description. At the beginning of the summer I let Isabella and William trade rooms. And it was a good switch to have the 2 oldest downstairs sharing a room, and William up stairs with us. But all good things come to an end. It was time to switch them back. 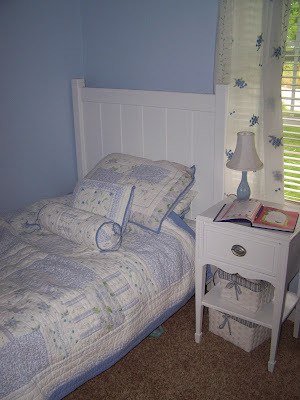 And as we moved them back to their prospective rooms, what a eye opener for this mama. I knew of Isabella's hording / collecting tendencies....however there just are not words to describe it accurately. Let me explain. Roofing shingles. Yes, She had saved a roofing shingle from Lord knows where, because "it was warm" And straws, yes, misc used straws. And my personal favorite an ice cream bucket turned into barbie house. I'll give her creative, that's for sure. But our house is just not big enough for so many "treasures." Thank goodness it was trash day yesterday. So out with the "treasures" and on come the sad eyes, and tears. Mine were tears of joy to have order back in her room. Hers were tears of sadness of her "special" things. Some days I see this type of junk laying around and just secretly throw it out...But I began to think yesterday we need to address this issue and teach her how to de-clutter. And after a little sadness, came an acceptance. And she was o.k. We now have a drawer for barbies and dollies, a drawer for baby clothes, a drawer for purses, a place for CD's. We have order. And I am giddy. I can tell she loves it too. She now has a reading "spot" in her room. 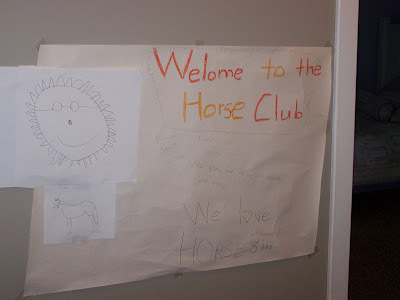 And apparently we have a Horse club. I found this taped to the wall next to her door yesterday. The sign reads: We play fun games, eat snacks, and more! And we found her devotional book that she started doing....and loves. See those baskets above??? Each have a purpose. Each have a category. I am happy. Today we took a break from the organizing / cleaning mode, because I wouldn't want to finish all of the house right now....it would leave me nothing to do this fall/winter. Ha ha ha, I'm sure by that time I'll have to work on Isabella's room again. This is my sister-in-law Arlene and my husbands mama, Elsie. We made 38 quarts all before lunch. It went fast. 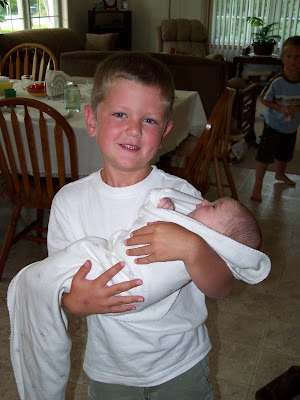 The newest cousin was there at 2 1/2 weeks old, Cale. 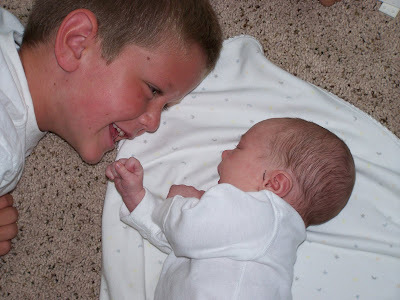 Jack adores him. And here Jack is showing off that he can "walk while holding him" Hmmmm, making me a little nervous. Jack: "What do they do with you when you die? Do they just put you in the ground, and put a blanket on you?" Donovan: "No they put you in a box called a coffin, and put you in the ground." Jack: "Don't talk about it- it freaks me out." Donovan: "You brought it up." Jack: "It was kinda like I was in a coffin when I was in mama's tummy, right?" 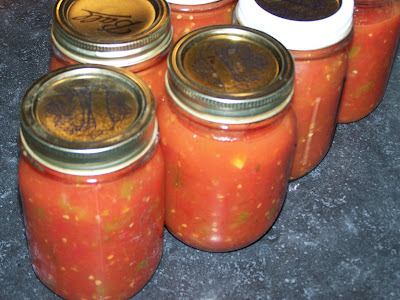 Can you post your salsa recipe? I don't have one and want to can some this year too! Looks great!! Oooh, I need to declutter my room! That would be so nice. The salsa looks great. I need to see if I can grab some portraits of that baby sometime soon. I am so jealous! I love decluttering other people's spaces! Since I don't have my own space to declutter right now, I am working on Mom's house. Good thing she is out of town. 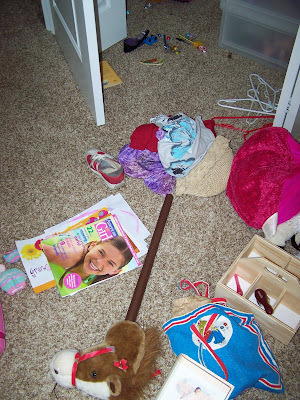 I'm glad that Isabella has such a great mom who thinks of things like teaching her decluttering skills. I'm afraid Helen is going to be a collector, too, the way she hauls "treasures" around. This evening, it was a pair of her tennis shoes, her sippy cup, her bear, her tiara and her Snapple-flavored chapstick. I don't know how she fits it all in her arms. I knew Nicole would be proud! Funny how much both of your posts today made me think of the other one. You decluttered. She tangled with the cart nazi. Ha! 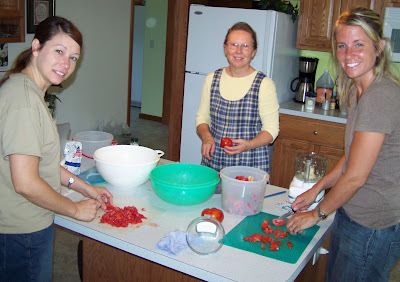 Cathy Fellers has a DELISH fresh salsa recipe. I may have it. I'll have to look. Yours looks yummy. i love the horse club. i would join! what a sweet daughter. it's all about training right? this reminds me so much of what goes on in our house!!! This sounds like our house too! What am I supposed to do with Olivia's rock collection? (not pretty rocks, just rocks from outside). 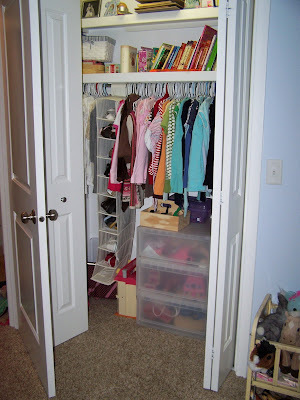 I LOVE to walk into a room or look into a drawer that is freshly organized!!! So refreshing!!! 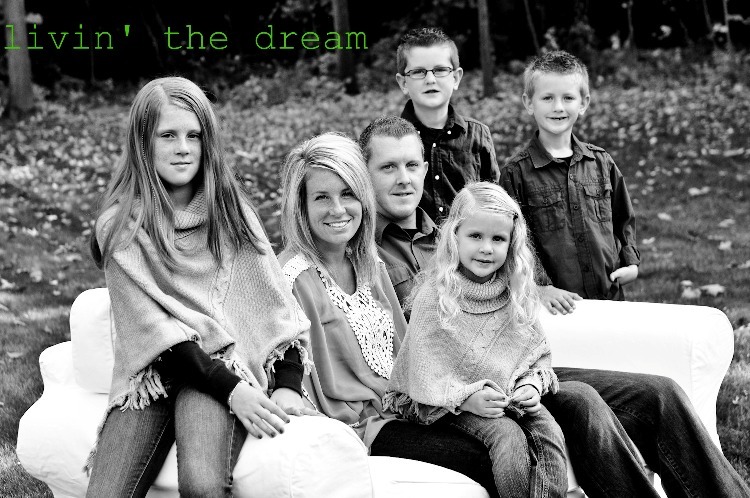 Thanks for the inspiration to declutter and for the pictures of sweet little Cale. Hilarious quote as usual. You could write a coffee table book on "funny things kids say"...did I tell you that already? It takes food dangling in front of me to comment!! Salsa looks wonderful. Isn't it fun to declutter. Isabella should come and give Emma some tips on how to do that.